Trailing and twining, climbing and clambering, a variety of succulent vines have showy flowers and unusual foliage. Some hail from tropical and subtropical climates and are kept as exotic houseplants. Others have interesting, modified leaves that function as water storage. 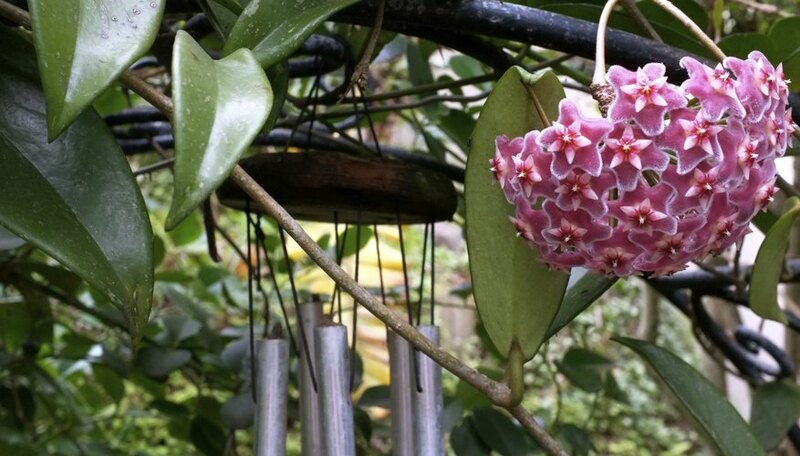 Wax plant, also called Hindu rope and honey plant (Hoya carnosa) grows in U.S. Department of Agriculture zones 9 through 11. In its native habitat, wax plant can clamber more than 20 feet. Potted and grown indoors, however, it trails only 2 to 4 feet. Clusters of fragrant, pinkish-white flowers bloom in late spring to early summer and have a dark red star at their centers. Fleshy, glossy green leaves up to 3 inches long cloak the trailing stems. Other common names for string of hearts (Ceropegia woodii, syn. 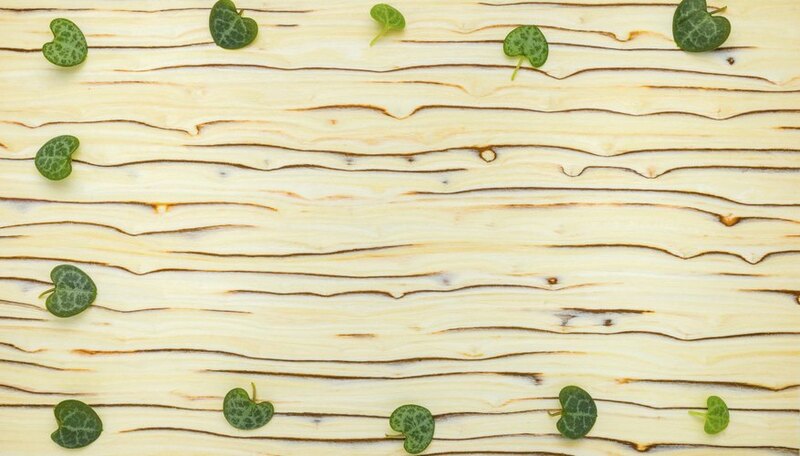 Ceropegia linearis woodii, USDA zones 10 and 11) include chain of hearts, hearts on a string, sweetheart vine and rosary vine. Like the wax plant, it is in the milkweed family. Grown for its small, mottled, heart-shaped leaves, string of hearts also has tubular pink flowers from late summer to early fall. In a hanging basket, its stems trail from 1 to 3 feet. The long stems can also be trained upon a small trellis or topiary form. 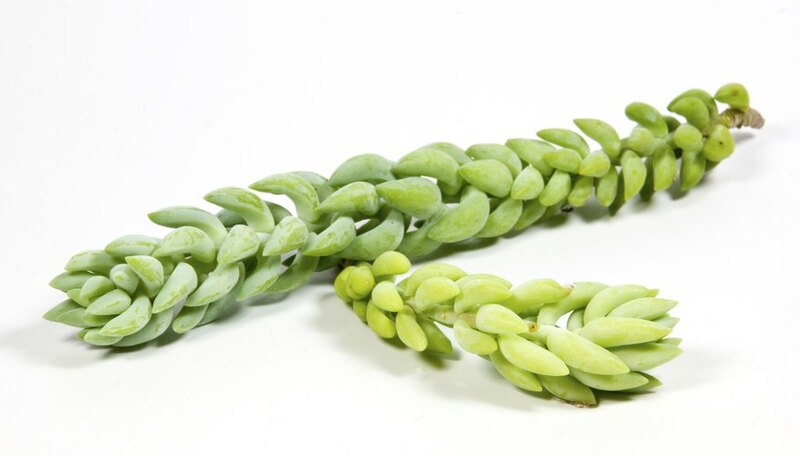 Also known as donkey's tail, burro's tail (Sedum morganianum, USDA zones 10 and 11) has stems sheathed in succulent clusters of blue-green to lime green modified leaves which allow the plant to store water. A drought tolerant, low-maintenance container plant, in six to eight years its stems can become 4 feet long. 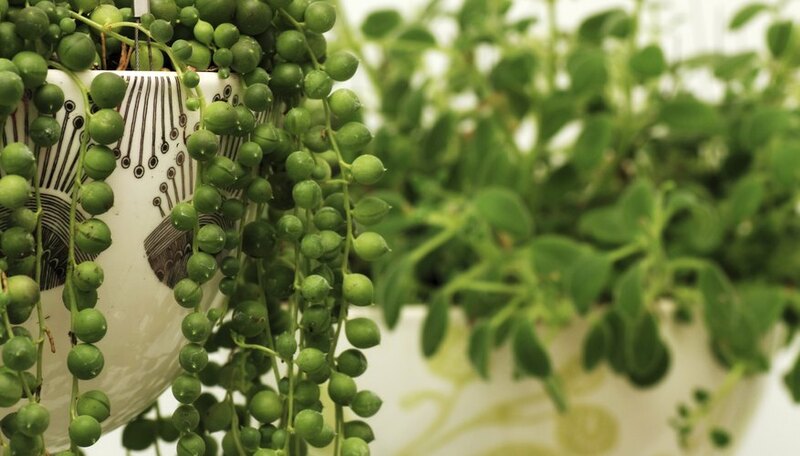 String of pearls or bead plant (Senecio rowleyanus, USDA zones 10 and 11) is another succulent vine whose pea-shaped leaves are adapted for water storage. Its trailing habit, up to 2 to 3 feet, makes string of pearls a smart choice for hanging baskets. With fragrant 1/4-inch white blooms in the summer that smell like cinnamon, string of pearls is part of the aster family. Michele Chambliss has 20 years of professional and home gardening experience. A horticulturist and landscape designer, she works as a design consultant and writer. She spends all her spare time experimenting in her own urban plot.